Albert Ebosse, the player who died after a match in Algeria last year, was murdered, according to his father. 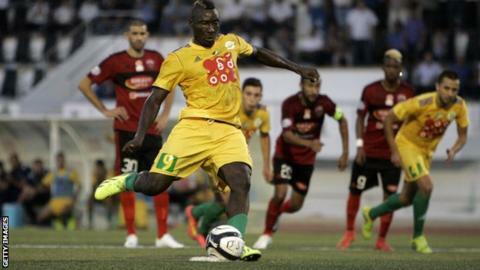 Cameroonian striker Ebosse died aged 25 in August after JS Kabylie lost to USM Alger in the Algerian top division. The official Algerian report suggested Ebosse died in hospital from head injuries sustained after objects were thrown from the stands. "It wasn't a rock. It wasn't a seizure. My son was murdered," Andre Bodjongo told BBC World Service's Sportshour. "Since my son was killed, not the president of JS Kabylie, not even any of his team-mates have sent me their condolences. Nobody has called me from the club, nobody." The pathologist who carried out post-mortem tests in Ebosse's home country, Cameroon, said the player died as a result of a beating. The post-mortem in Cameroon claimed that Ebosse received "a blow to the head" that caused "an indentation of the skull" and impacted his brain, and that he suffered upper body injuries which indicated "signs of struggle". Other signs of violence included "rupture of cervical vertebrae" and a wound to the shoulder. Algeria's Ministry of Justice opened an inquest into Ebosse's death on 19 December, but the results have not been published. Ebosse's father wants the Confederation of African Football and world governing body Fifa to get involved. "All I want there to be is justice," Bodjongo added. "Those responsible for world football, they should make sure that football stays as a sport and not a war. "If investigations are done properly they will find out who killed Albert. "Albert was someone who absolutely loved his job, loved football." Ebosse, the top scorer in Algeria in the 2013-14 season, was on the brink of a call-up by Cameroon and was attracting interest from European clubs. "When I lost Albert, my hopes in life were completely ended," said Bodjongo. "Albert left a little girl who is only one. His big brother, who died eight years ago, left behind four children who are all under 20. "So you see what situation I find myself in - me a grandfather of 75. "I'm in tears even talking to you now. If I talk about these children, I start crying." Listen to the full interview on BBC World Service Sportshour.